Retro gaming interest is at an all-time high. Our kids may not enjoy the same titles that we did as youngsters, but they enjoy many “spiritual successors”. Bad Bots, from Point 5 Projects, could be classified as one of those titles. Channeling many older 2D PC platformers, Bad Bots looks to scratch that retro itch in old and new gamers alike. (-) Why are there no grenades?! Bad Bots takes place on the spaceship Titan Hauler, a retired Navy vessel converted to a garbage scow. What was once a routine garbage trip has become a robotic mutiny. 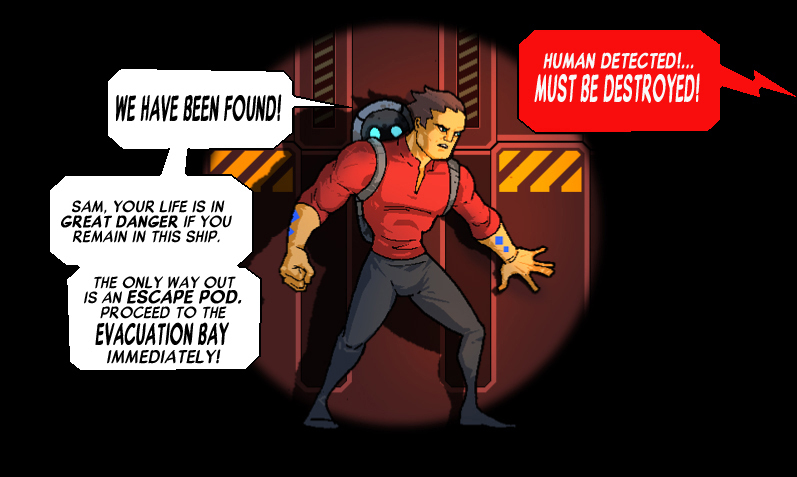 Stepping into the space boots of Sam McRae, the ship’s mechanic, you are the last human alive aboard the Titan. You awake in the compaction bay, bust out of your cryostasis chamber, and stumble onto your guide, Mother-the broken robotic body of the Titan’s historian. Mother informs you that the robot workers on the ship have been reprogrammed to kill all of the humans aboard. The first step to find out what went wrong, after escaping the trash compactor, is to track down the ship’s AI, Dana. So begins your journey through 170 rooms aboard the Titan, as you reverse the wave of genocide onto the rogue robots. Bosses usually have your number! 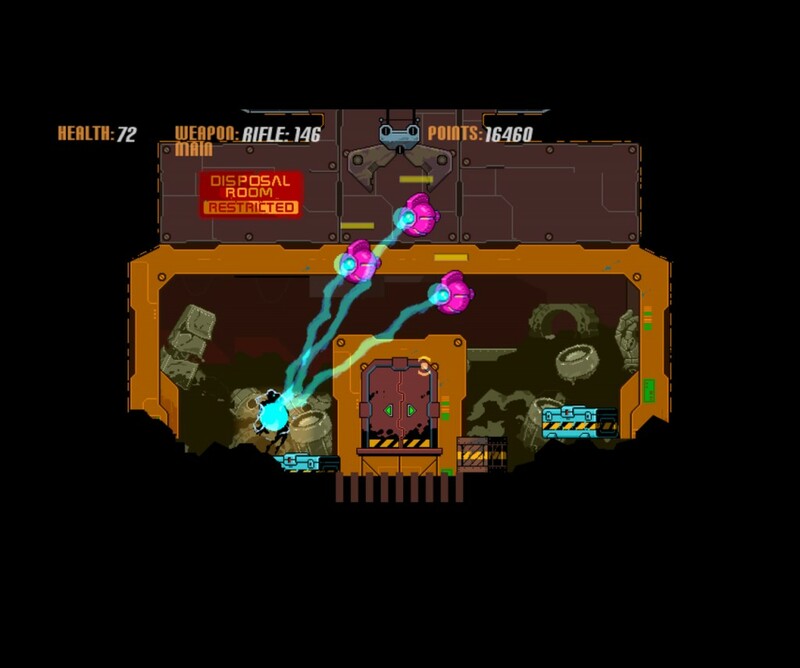 The gamplay takes place in a 2D, twin-stick shooter control scheme. For old-school PC players who have played ABUSE, the control scheme will feel right at home. You use the ‘WASD’ keys to move and the left and right mouse buttons to shoot and melee attack (respectively). Those controls are supported on a gamepad, mapping the right analog to replace mouse aiming, but the keyboard controls felt much more at home to me. Story segments play out over comic-style panels filled with dialogue bubbles. The aesthetic, the gameplay, the lack of voice acting all hearken back to the glory days of PC gaming. Bad Bots feels like a Commander Keen, side-scrolling Duke Nukem title, or so many other shareware titles that hold a special place in my heart. It’s a 2D action game that’s heavy on action and light on plot. Running and gunning is fun, but it’s not going to get you very far. There is definitely an old-school challenge involved as you must shoot strategically, dodge and crouch behind cover to stay alive. Bad Bots isn’t without a few short circuits. It seems that the robots always get the jump on you and know which floors to shoot through. The boss battles can be a little frustrating, leaving you wondering how to counter them as you die in repetitious fashion. Still, I can’t help but wonder if those mechanics were purposely crafted to aid in the retro feel and difficulty of the game. Bad Bots doesn’t try to reinvent the wheel, but it does provide solid retro gameplay. It brings back the old days of fun side-scrolling action games powered by my DOS himem reconfigured boot disks. 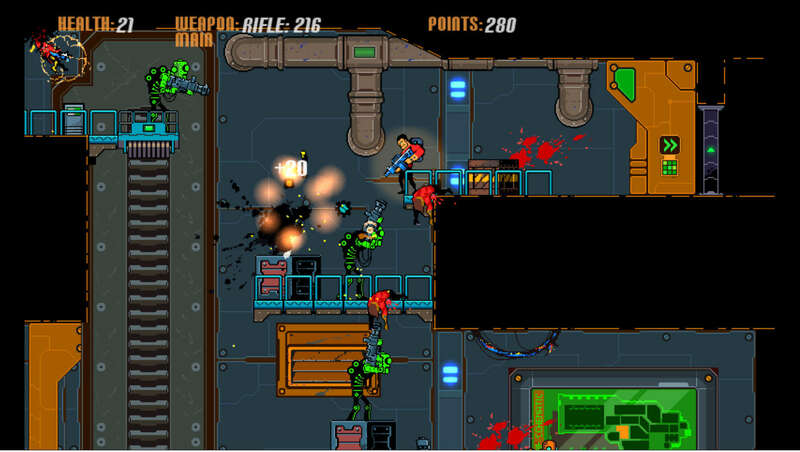 Bad Bots is a really fun downloadable arcade game that’s an easy recommendation for the low price of $9.99 on Steam. It gets an 8 out of 10. This entry was posted in Android, iOS, PC and tagged Bad Bots, Digital Tribe, indiepub, Point 5 Projects. Bookmark the permalink.